Abraham went down to Egypt because of a famine. While he was there God sent a plague on the Egyptians and got Pharaoh so angry that he demanded Abraham get out of the country and even gave him riches to do so. Sound familiar? Ray referred to the book Exploring Exodus- the origins of Biblical Israel by Nacham Sarna. The shortest route from Egypt to Israel is along the “Way of the Philistines” road which follows the Mediterranean; it is about 225 miles. But God had another route in mind. Exodus 13:17-22, "And it came to pass, when Pharaoh had let the people go that God didn't lead them by the land of the Philistines, although it was the more direct route to Canaan; for He said, 'In case the people become discouraged when they have to fight, and they return to Egypt'. So He led the them by way of the wilderness of the Red Sea: and the children of Israel went out of the land of Egypt in ranks." God just defeated the equivalent of the “United States” (most dominant world empire at the time) but now he is concerned about Israel fighting Puerto Rico. The thing is that in Egypt, God did all of the hard work and now he wants Israel to get involved. While Ray wouldn’t take a position on where the parting of the sea took place or where Mt. Sinai is located, he said that everyone agrees that they spent a considerable amount of time in the Sinai desert. It is extremely mountainous, very hot during the day (120 degrees) and cool at night (50), has very little water - and plenty of scorpions. Judges 2:22 “so that through them I may test Israel, whether they will keep the ways of the LORD, to walk in them as their fathers kept [them], or not." Like so many Hebrew words, the word “test” נסה nacah goes deeper than our definition. It is not what you know, but how you react when there is no water. So God led the people around [by] way of the wilderness of the Red Sea. And the children of Israel went up in orderly ranks out of the land of Egypt. “in orderly ranks” The Hebrew word here (according to Ray) actually means “with their arms raised”. This is an indication of a “gung-ho” kind of attitude and is reminiscent of how Pharaoh is often depicted. So, how was God going to train these people? Put them through the boot camp of a desert experience where they would learn the lessons. But we’re getting ahead of the story. 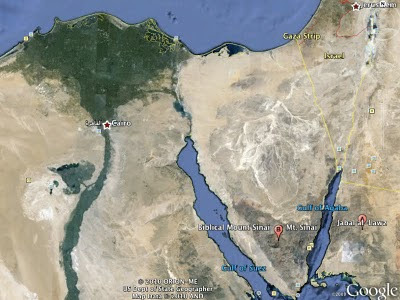 In the image above from Google Earth, the green Nile delta is obvious in the upper left. The Hebrews were led by the Pillar of Fire to a dead end at the Red Sea - and exactly which body of water that is - was only partially explored. While he didn’t go there, the two major contenders are the lakes in the vicinity of what is today the Suez canal or the Red Sea itself which is between the Eastern end of the Sinai Peninsula and the country of Arabia (ancient Midian), called the Gulf of Aqaba today. In Arabia there is a mountain called Jabal al Lawz (see above) which has a blackened top and an altar with carvings of cattle on it. Mt Sinai, according to the book of Galatians is in Arabia. The traditional site is shown as well. Several Christians have risked their lives going to Jabal al Lawz, for the Saudis have surrounded the area with fences and armed guards. I talked with a man (Ron Wyatt) who has been there and heard him describe his adventures. A likely spot to cross the Red Sea is at the southern end of the gulf of Aqaba (where the distance across is reasonable. But I digress. As the Jews were facing the Red Sea, with mountains hemming them in (there are no mountains near the Suez canal), the 600 chariots of Pharaoh were approaching. Again, they cried Ze’ekah! In their fear and panic they hurled sarcastic insults at Moses and God: “Weren’t there enough graves in Egypt that you had to bring us here to die! Why didn’t you leave us alone as we asked?” Then the Lord said to Moses, “Why are you crying out to me? Tell the Israelites to move on - start walking! (into the sea). Prove to me that you are sold out to me! Get your feet wet. You all have seen the Ten Commandments and the Prince of Egypt, so you can imagine this part. On the other side, the people celebrated with the song of Miriam. Ray talked about how he and his wife pack differently when they go on an extended trip. He packs very light with one change of clothes and the bare essentials, while she brings a lot of stuff. All this to say that Miriam and other women had brought tambourines which were used to praise the Lord. God had brought the people through the first part of their desert experience and capped it off with a mighty display worthy of praise and worship. Google earth as a tool for Biblical Archaeology...I like it!